BlackTop is a permanent, moisture-cured, UV stable coating primarily used for topcoating surfaces previously sealed with RustSeal or any other paint/primer application. BlackTop is a high performance protective coating specifically formulated to withstand dulling and fading caused by prolonged sunlight exposure. BlackTop may be used alone as a resilient coating but it will not offer the ultimate rust protection unless it is used in combination with RustSeal. For the best stop rust & ultraviolet protection, first apply RustSeal to permanently seal the surface and then topcoat with BlackTop for an incredibly tough and professional looking finish. Available in Gloss Black, OEM Satin Black & Flat Black. Like RustSeal, BlackTop dries to a rock hard yet flexible coating that can be readily applied to chassis, coil springs and light weight panels. BlackTop also has high heat resistance and can be applied to almost all automotive applications except exhaust systems. BlackTop is now available in a convenient Aerosol Spray Can! NOTE: If you are unsure of what sheen of BlackTop you want, please request an actual color sample HERE. Theoretical coverage at one mil (25 µm) is 400 sq.ft. per gallon/9.8 m² per liter. Material losses during mixing and application will vary and must be taken into consideration. Expect up to 50% less coverage on bare wood, rough or sandblasted surfaces. 5 Gallon: 2000 sq. ft. Item is great, dries rock hard. I have not had any problems with problems applying it to the chassis. Levels well and cures with a nice sheen. Also blends well with touch. Very happy with the finished product. I used the brush to apply this product. It looks like it was sprayed on by a body shop. I used the blacktop and it really looks great. It was about 90 degrees when I brushed it on so it was drying really quick. I thinned it out with the kbs thinner probably more than what was recommended but it really helped it go on smooth. I need anothe quart at this point to finish my chassis. It'll probably be 2 quarts in total to do my entire chassis on my 63 impala frame and suspension parts. I also used the engine coater and only used a half a pint to do the block and valve covers. Also great stuff. Oh yeah. Don't get it on you or you'll be a walking advertisement for kbs coatings. I've found that if you get some on you skin you can soap it up and use a shavers razor to remove most of it. It's good stuff. I can't believe stretchy it is. However, it was difficult to keep it from running, forming drip marks. If not for that I would give it the full 5 stars. Love kbs!! I used this on my 73 dodge charger for the door jambs as well as the underside of my front bumper air flow and trunk. Nice clean finish and last for years. The product sprays out nice and lays down smooth. I covered the underside of a '79 Trans Am and the front frame clip with 1/2 gallon of the product. Looks great, I would recommend the product. The OEM satin black is little shinier than I expected but still looks great. I like this paint, it is very hard and shines great. I will know more in a few months about how it holds up. Q: Can I brush on the BlackTop paint or does it have to be sprayed ? What type of a brush for a smooth finish? Do you have a picture of the Gloss compared to the OEM Black. A: Yes, you can absolutely brush BlackTop. Depending on atmospheric conditions, it might be best to thin BlackTop 10% with KBS #1 Thinner if you are brushing to ensure that the brush marks flow out really well. At this time, we do not have a piece that shows the Gloss versus the OEM Satin, but we will add that to our development list. Was this answer helpful? 23 of 25 Customer(s) found this Answer helpful. 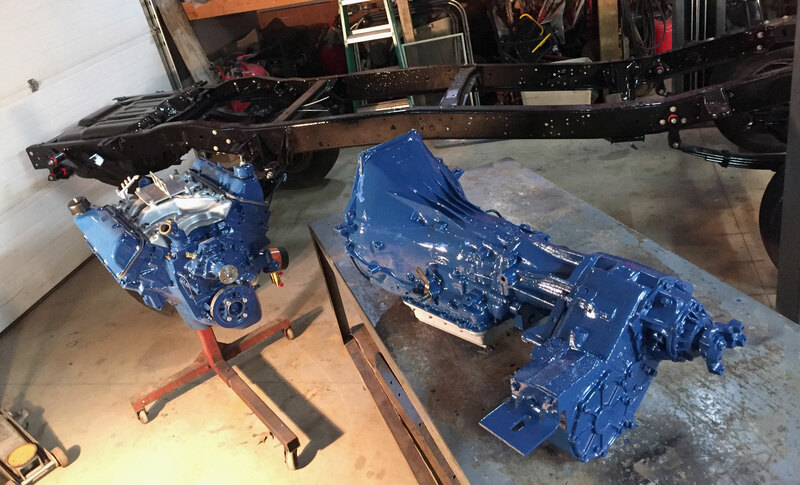 Q: Will your product of the KBS Klean, RustBlast, RustSeal, and BlackTop work for cleaning, prepping, sealing, and painting the aluminum housing and out-drive unit on an marine engine? 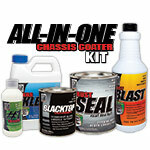 A: Yes, our prep system used in conjunction with RustSeal and BlackTop are ideal for marine applications. 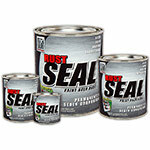 We would suggest applying 3 coats of RustSeal and 2 coats of BlackTop for marine applications. Was this answer helpful? 19 of 23 Customer(s) found this Answer helpful. Q: How much material do I need to cover the frame and underneath-components of a full-size pickup truck? 2 quarts? 1 Gallon? Thanks!! A: 2 quarts will probably be enough, but depending on overspray or waste, it could take up to 3 quarts. This complete kit takes our popular Frame Coater Kit to the next level. 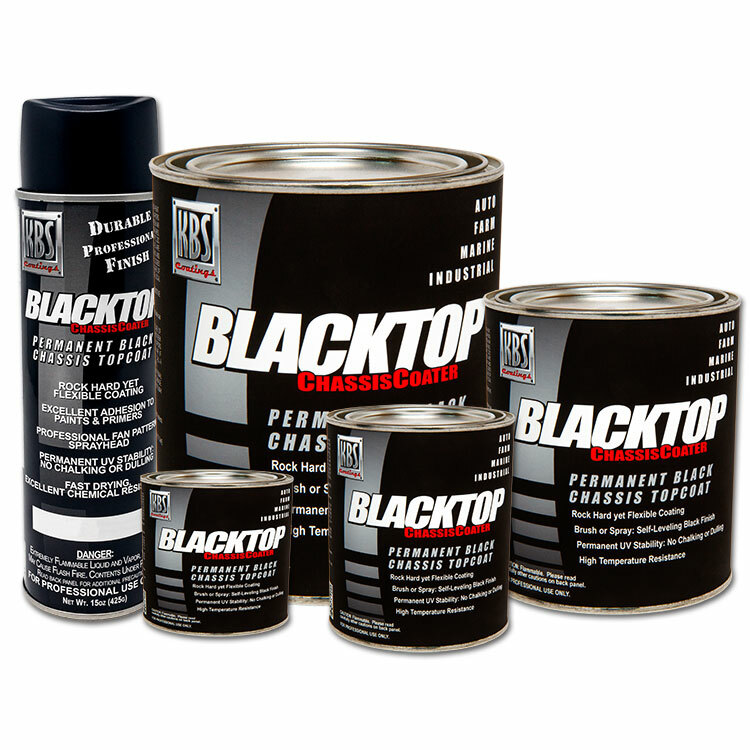 In addition to the complete KBS 3-Step System, this kit includes a pint of BlackTop topcoat for a permanent final finish which withstands dulling and fading caused by prolonged sunlight exposure.